Here at Vitality Natural Healthcare Center you may hear me speak about Standard Process. You may think it’s some sort of new healing modality, but it’s actually the go-to line of whole food nutritional supplements. Standard Process has been around since 1929 and has dedicated themselves to the field of nutritional supplements and the whole food philosophy. Dr. Royal Lee had it right when he said, “The best source of vitamins and minerals are found in whole foods.” The goal of Standard Process and of Dr. Lee is to provide nutrients as they are found in nature. Now you may be asking, “What is a Whole Food Supplement?” Well it’s pretty simple. It’s a combination formula that includes plant and animal extracts, desiccates or other ingredients. Whole food supplements may include foods that are prepared in a way that safeguards their nutritional value. Standard Process can provide ingredients grown locally on their certified organic farm, including alfalfa, barley grass, beets, brussels sprouts, buckwheat, kale, kidney beans, oats, pea vine and Spanish black radish. Their dedication to the quality of the ingredients is imperative to their brand. They can control ingredients from seed to supplement. Take Catalyn for instance. Catalyn is the formula for general daily support. It is akin to a multi vitamin. It helps support all the critical functions of the body. It also has the wonderful “side effect” of awesome SKIN, HAIR AND NAILS. Unlike the mainstream products on the market, Catalyn contains no synthetically produced vitamins or nutrient isolates; just whole food nutritional compounds. An example of a “complex Formula” is Allerplex. We all know someone in the Lehigh Valley who suffers from allergies. Allerplex is a special combination formula designed to support healthy liver function, proper pH balance in the body and maintain healthy function of the sinuses and lungs. This formula results in an a more comfortable transition for one season to the next. Who wouldn’t want that? The primary reason that I carry Standard Process formulas is not because of their purity, their commitment to excellence or their farming practices. I carry them because it is what I grew up with. My dad carried S.P. in his chiropractic office for nearly all of his 42 years in practice. When I was feeling anything less than optimal, I would get an adjustment and some tablets or capsules to take. I know PERSONALLY how well Standard Process works to aid in keeping you working optimally. I have always been impressed with how well they worked, and you will be too. With over 80 different formulas, there is something for just about anyone and anything. There are even formulas for kids and gluten-free options as well. Ask any of us how we can help you find the optimal product for you. If I were to ask you to go to your kitchen cupboard, grab a glass and then try to fill another glass with it, you couldn't do it. Not the “grab a glass” part, I'm sure you have one or two in your kitchen. You'd have to fill up your glass first. You know you can't fill another glass+ until the one you're holding is first full. We operate on the same principle. Without filling the ‘glass’ of our own hearts, we cannot continue to pour out our love to others for very long. Taking the time to stop and fill up our own glasses can feel like it's one of the hardest things you'll ever do. We are so willing to love someone else, appreciating all the little things regardless of the status of their bank account, receding hairline, illness or IQ. However, turn that mirror around and those are the very things that cause us to feel unlovable, undeserving, unwanted. So, in this month in which we set aside an entire holiday to celebrate how much we love other people, I challenge you to take the time to practice a little Self-love. It can be a simple, if not easy (those are not necessarily the same) thing to do even if you're resistant to the idea at first. Start your day by writing down 3 things you are grateful for in general. It need only take a minute or two. Then, add one about yourself. What is it that you do like about yourself? Your amazing mane of hair? Your willingness to help a friend in need? How good you feel after your morning workout? Pick at least one and write it down. This doesn't have to take long. In fact, it shouldn't. List the first thing that comes to mind. And if you really think you can't find anything, make it up. What would you appreciate about yourself if it were true, if you were looking at the best version of you? Write it down, create your future ahead of yourself. Then, throughout the day, take a moment when you remember to appreciate that quality again, “Man, I can really make some great tasting, nourishing food!”. Allowing ourselves to appreciate all those things in ourselves that we admire in others is one way to fill our glass. Another way is to take some time out to take care of yourself. Get that massage you've been craving. Buy that book you've been wanting to enjoy and set aside some time every evening to read. Set up that appointment to take care of yourself, rather than continue to put yourself second. Or third. Or dead last. Make your bed. Stop - and literally - smell the flowers. They're everywhere this month. I think you'll find that, just like the flight attendants tell us: when those oxygen masks fall, it's only when you take care of yourself first that you are then able to help someone else. Are you ready to contribute to something extraordinary? Then look no further… THIS is your opportunity! Vitality Natural Healthcare Center continues to grow and we are looking for an organized and enthusiastic OFFICE COORDINATOR to join our team! Our ideal candidate is someone who is seeking longevity in our successful practice and is ready to be a valuable team member with the ability to see our mission and vision through. Being in service is the utmost priority to contribute to this thriving practice. Vitality is a multi-award winning, established wellness center that opened in 1997. 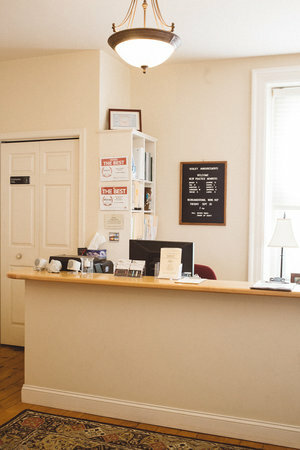 We are located in a three-story, free-standing second empire Victorian building which houses a Chiropractor/Holistic Health Physician and an Associate D.C., Reiki Master/Teacher, massage therapist, yoga instructor and an energy psychologist. We have very passionate practice members, many of whom are “lifers” and make us the healthcare choice for their entire family. Salary commensurate to experience with a generous bonus and incentive program. Superior income potential. Complimentary care for immediate family members. The Coordinator position provides comprehensive administrative support for daily office operations and interfaces with clinical director/owner and director of marketing. Excellent organizational, communication and interpersonal skills, ability to multi-task and take direction, solid computer and writing skills, flexibility in an ever-changing office environment, enthusiastic, team player, great sense of humor, strong interest in natural/alternative healing methods, willingness to grow and expand one’s personal development. Previous event planning and coordination is a bonus, but not required. Does this sound like you? Are you a good match and are you able to stretch in order to succeed? Are you willing to learn, work hard and have fun doing so? E-mail your resume and cover letter to info@thevitalitycenter.com or fax to (610) 966-7827. Did you hear the news? You may have checked out our recent Facebook video post. Dr. Darin and staff members are proud to announce the arrival of Dr. Indy Ishaya, Vitality’s new associate Network Care practitioner. Dr. Indy comes to us from North Carolina and you will begin to meet him in person this week. Soon he will be able to share his love of chiropractic care in the office. We couldn’t be more excited to add a new member to our team here at Vitality and look forward to serving more of our community with super rich energy and additional office hours. Our practice members are family! Linda L. shares the impact that Network Care has had on her life. Are you ready to be a part of something extraordinary? Then look no further… THIS is your opportunity! Vitality Natural Healthcare Center continues to grow and we are looking for a self-motivated, enthusiastic MASSAGE THERAPIST to join our team! Our ideal candidate is someone who is seeking longevity in our successful practice and is ready to be a valuable team member. This position is perfect for a recent massage therapy graduate or an experienced therapist with an established book. Being in service is the utmost priority to contribute to our thriving practice. Immediate opening for morning, afternoon and evening hours with some weekends. Reliable and consistent schedule. Must have valid license and carry liability insurance. Self promotion, positive attitude and being a go-getter are also a must. Social media skills are a plus. Seeking techniques to include but not limited to: Swedish, deep tissue, prenatal, hot stone, reflexology, MFR and lomi lomi. Does this sound like you? Are you a good match and are you able to stretch in order to succeed? Are you willing to learn, work hard and have fun doing so? E-mail your resume and cover letter to our Office Coordinator Alicia at alicia@thevitalitycenter.com or fax to (610) 966-7827. Vitality is a multi-award winning, established wellness center that opened in 1997. We are located in a three-story, free-standing second empire Victorian building which also houses a Chiropractor/Holistic Health Physician, Reiki Master/Teacher, yoga instructor and an energy psychologist. We have very passionate practice members, many of whom are “lifers” and make us the healthcare choice for their entire family. Vitality has an incredible, committed staff with rock solid office policies and structures. ONE DAY ONLY - MONDAY, JUNE 25! It’s been 25 years since Dr. Darin took his FIRST Network Chiropractic seminar at the Peabody Hotel in Orlando, FL. To celebrate this anniversary, he is offering these specials as a THANK YOU to everyone who has ever been served by Network Care. All merchandise in stock is 25% off! Purchase 25 entrainments for $25 each! * If you are already on a prepaid savings plan, you can still purchase the 25 entrainments as an addition to your current plan. These visits are designed to be used once a week with a December 31, 2019 expiration date. * If it’s been awhile since you’ve been under care (over 6 months), you may still purchase this plan and we will reward you with 50% off Re-Activation. $45 savings! * This is a one-time offer valid only on Monday, June 25. Plan is $625 total. In order to purchase, you must stop by the office with full payment of check or credit card. You may also call the office at (610) 965-0023 with a credit card. If using CC, 2% fee applies. You may have also seen we are now on YouTube! Hope you enjoy scenes from our Breakthrough healing retreat on Saturday, May 19, 2018. It was truly an incredible day!